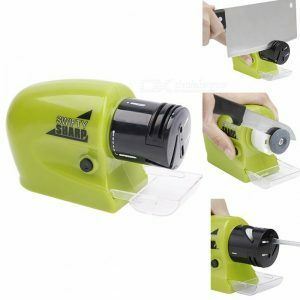 Home » Electric Knife Sharpener » How to Choose Electric Knife Sharpener – Features or Price? If you’re looking for a good electric knife sharpener that makes your life easier, read on to know the criteria that you have to look for when choosing the best. 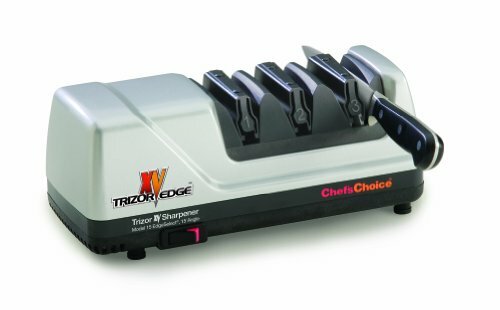 You might be thinking that the most expensive knife sharpeners like the Chef’s Choice knife sharpeners available in the market are the best ones. It is not always correct. Some sharpeners which cost less also have the most number of stages and sharpening material to deliver razor-sharp edges. The costly ones look very attractive and fancy so that you can always keep them outside to make it visible always. But the less priced sharpeners will be kept inside the cupboards. You know that diamond is one of the hardest materials which can be used in a knife sharpener. But when you think of diamond, you will feel that it is very expensive but the truth is that only the polished version of diamond is costly. So you can go for cheap sharpeners where unpolished diamond is used. These sharpeners will last for a long time. The Work Sharp knife sharpener comes with different grit of diamond abrasives to sharpen knives in minutes. Chef’s Choice 15 Trizor XV – Combines the strength and durability of the Trizor edge with the flawless, ultra-sharp 15-degree XV technology. During the process of sharpening a knife, small metal bits will fall from the unit. This may result in a complicated mess if the shards are not collected by the sharpener properly. You may find some sharpeners contain a bin to collect the shards that should be cleared out periodically. Some other models contain magnets in their designs, which are considered the best and most useful device to clean the metal shards. The magnet pulls all the metal shards; hence provides a good amount of safety. Some knife sharpeners will have a polishing stage in their design. Sometimes when you are sharpening the knife, it may get scratched due to the grinding of the blade. The polishing stage in the design comes in handy, to make the knife look better in appearance. Another advantage of polishing stage is that it removes the excess metal shards from your knife which ensures that you don’t accidentally swallow the metal while cutting something with your knife. Multiple slots are provided in the sharpener which you may require for different types of edges on the knife. Because you may use different knives for different tasks and you may not always require very sharp knives. During the sharpening process, the bits of metal should be removed from the blade to make it sharper. Hence you must make sure that the sharpener you are going to purchase is easy to clean. If it is not so, then the metal shards falling accidentally on the floor may prove to be dangerous. It is better to find out from the existing users whether the unit is indeed easy to clean out. If the unit is to be left out on the counter after use, then you have to check the size of it. First, decide whether your counter will be able to accommodate the unit in the designated space. Also, you have to make sure that the unit should be able sharp the type and size of the knives you have. Suppose if you have thicker knives which you are not able to fit in the sharpener, then the product may become useless.